In this tutorial I will create animated CSS3 background with floating clouds. It is a lightweight yet great way to create beautiful website backgrounds. Heavy SWF files are no longer needed to create such animations. 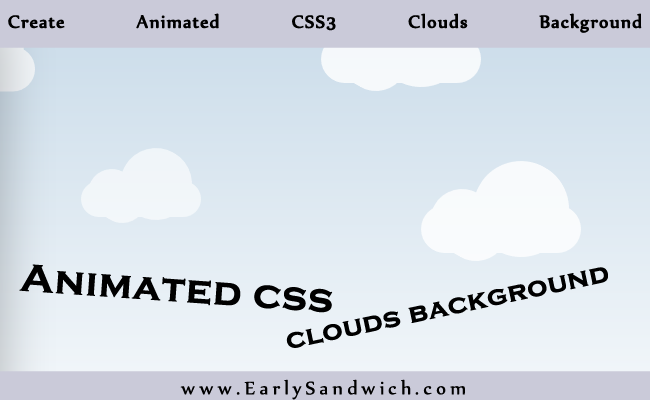 I will only be using CSS3 and HTML to create animated clouds background. Now I will show you how you can implement CSS3 cloud animated background to your website. I will be using basic code from here. Insert the below code just after the start of <body> tag in an HTML file. Insert below code in <head> section of your HTML file or into CSS file which is included in your HTML file. The code below is simple and is easily understandable to anyone with basic CSS3 knowledge.